Emmy London’s 2018 collection of luxury wedding shoes – Meadow Dreaming – is inspired by Creative Director Emmy Scarterfield’s admiration of English country meadows, wild grasses and florals. Carefully curated with summer in mind, these seasonal styles combine pastels, suede and natural touches. The design house’s creations are perfected with a keen attention to craftsmanship and comfort. And at the core of its business is the couture touch, where brides can embrace bespoke beauty. The classic glass slipper seems to be outdone by this Cinderella. Thanks to the hand-beaded details, this pair exudes glamour with mirrored glass, Swarovski crystals and bugle beads. And the on-trend block heel and t-strap provide comfort. This style also inspired many subsequent interpretations in various colors. The Arabella echoes the exquisite detailing of the Cinderella design in a gorgeous pink version. Skilled craftsman ensures precisely placed rose-colored Swarovski crystals highlight the shoe’s delicate pink color. As a blue interpretation of the Cinderella, Bluebell can be your something new and something blue! 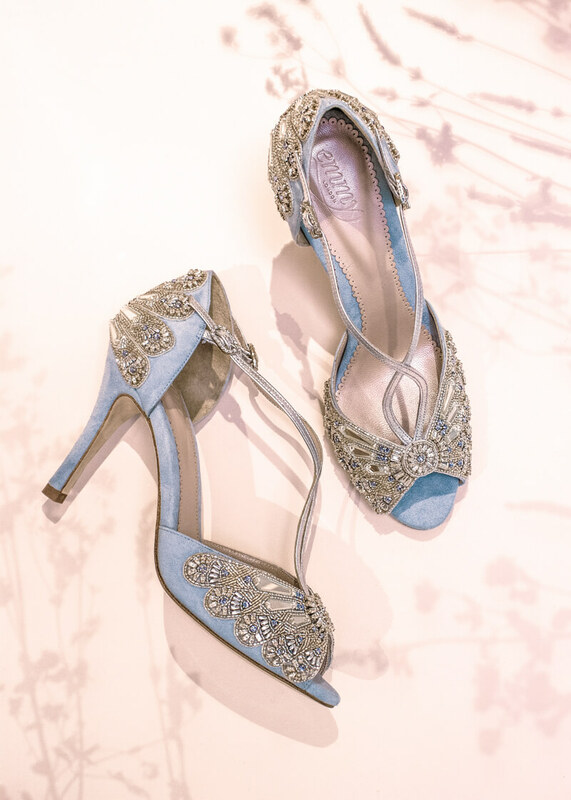 This pair features soft blue suede with hand-beaded aquamarine Swarovski crystals to give these heels just the right amount of sparkle. The Almondine introduces a new embroidery technique that makes this a standout pair in Emmy London’s collection. Feather-like details are achieved with hand-stitched gold thread, while gold beads provide multidimensional style and mirrored glass amplifies the sparkle. The Iris is a “contemporary spin on a classic slingback.” Featuring Emmy London’s famous slash-and-twist technique, the ivory suede is paired with metallic gold leather. Not only stylish, these heels are comfortable and effortless. When a pair of heels is described as “a work of art,” you know they are exquisite. 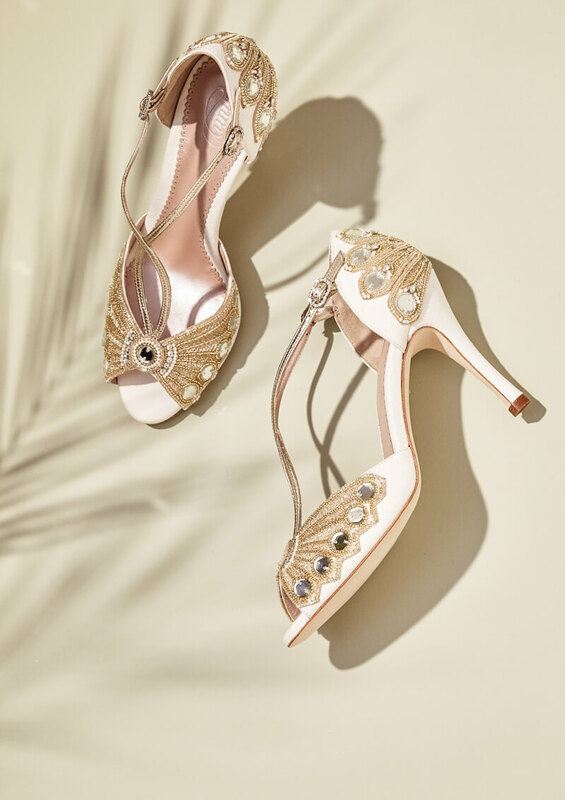 Blush Alice heels feature warm light pink suede, hand-beaded gold embellishments, mirrored glass and Swarovski crystals. The cross-over strap also provides stylish comfort. Bonnie brings wedding shoes to a new level. As Emmy London’s most beautiful flat, this pair is designed with elegant practicality in mind. Ideal for destination and outdoor weddings, this gorgeous pair of flats evokes glamour with hand-beaded details and are breathable enough to take you anywhere. Valentina is pair of pumps with pop. Thanks to the soft blush-colored suede, petite tassels, beading and scallops, this creation projects an art-deco style with a modern flair. 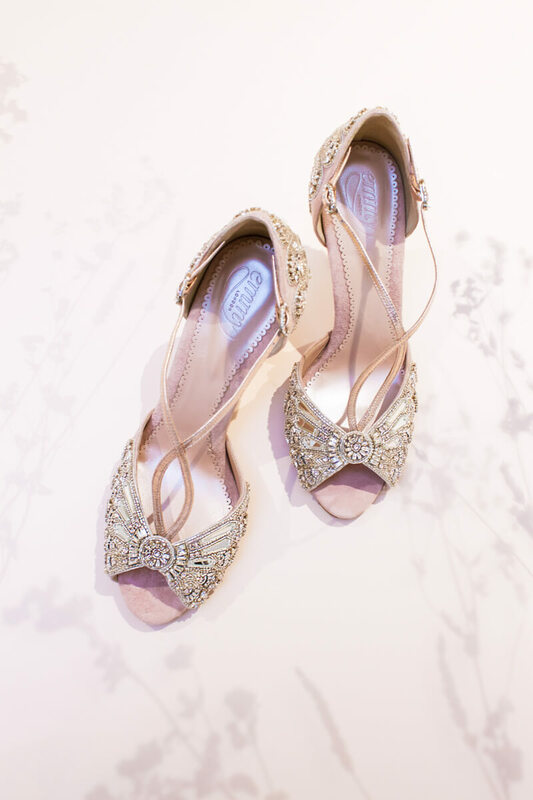 Meadow Jet is the choice for brides who want their shoes to make a statement. Made in soft Italian suede, the black court shoes are embroidered with grass shapes and flower silhouettes. And never fear – they won’t get caught on your delicate hemline, either. Another take on Meadow is this pair in Misty Rose. Designed to go from day to night, this pair of soft pink suede heels are embroidered with gold thread. Romantic and whimsical, they’re an idyllic choice for an ivory gown. The Isadora features a 4.5-inch heel and striking pointed toe. But hand-beaded floral embellishments in varying shades of blush soften the look and create a botanical impression. For the brides who admire pastels, afternoons in the gentle sunlight and the promise of a garden in bloom, Emmy London’s last collection of luxury wedding shoes embraces this invigorating season. Unparalleled in style, sparkle and statement embellishments, this collection takes a modern approach to elaborate detailing and gives way to a new spin on timeless wedding style. Choosing a design from Emmy London doesn’t just help you get down the aisle; it affords you a journey to explore your style, find exactly what you love and celebrate life’s most beguiling inspirations.